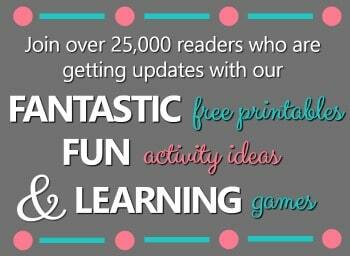 As Spring is in full swing, we have really noticed the birds out and about. They greet us every morning chirping and singing their cheerful songs. We even have a cardinal and sparrow family nesting in our yard! It’s so exciting to witness nesting and new life in our own backyard! 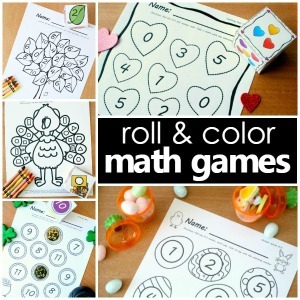 Home Preschool or your Preschool Classroom. 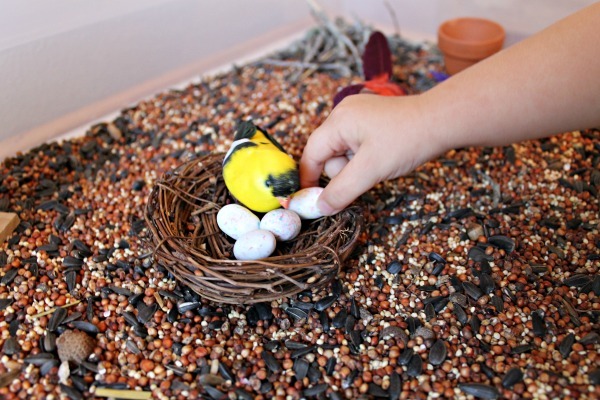 As we are learning about birds and their nesting habits, I decided to put together a bird nest sensory bin. We began our investigation into nesting by reading the books, The Best Nest and Birds, Nests & Eggs. 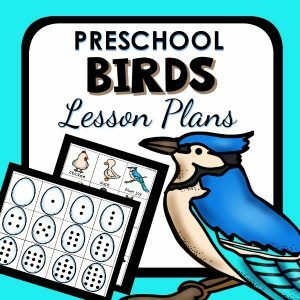 We learned that birds will gather twigs, grass, leaves, moss, and even small pieces of thread they may find to assemble their nests. 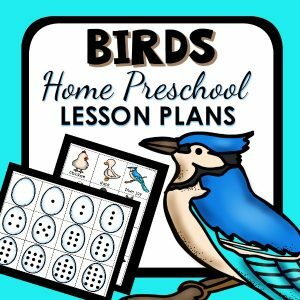 They may even make their homes in a birdhouse that are set out for them. 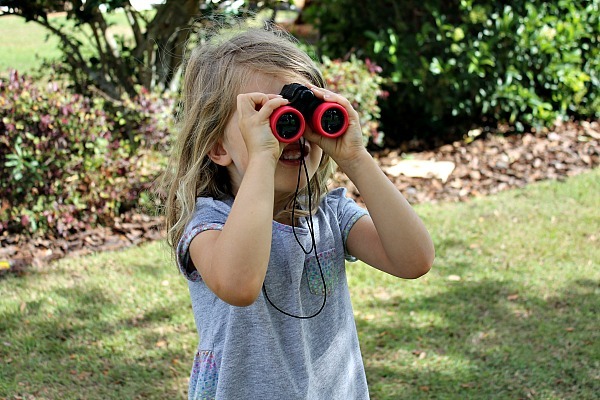 We headed outside and pretended we were birds that were looking for materials for our nest. My little ones loved hearing the birds chirp as we were searching for nesting materials. They rushed to find them with their binoculars. My oldest even spotted the mama sparrow flying into her nesting place. 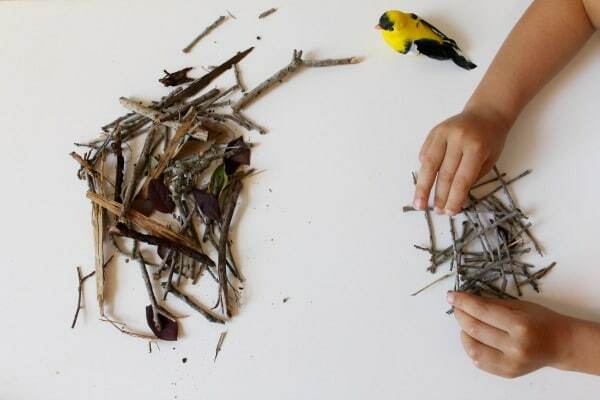 Once we were done collecting our materials, I asked my preschooler to pretend she was a bird building its nest. She took all of her findings and began to stack and weave them to make a cozy nest. Soon, she found that this was no simple task. It took thoughtful consideration to place sticks and leaves in such a way that would create a strong and sturdy nesting place. After our nest building, I gave her a sensory bin to further explore bird nests. Pretend bird eggs-We used chocolate eggs, but we’ve also used plastic eggs in the past if you are unable to use food items. 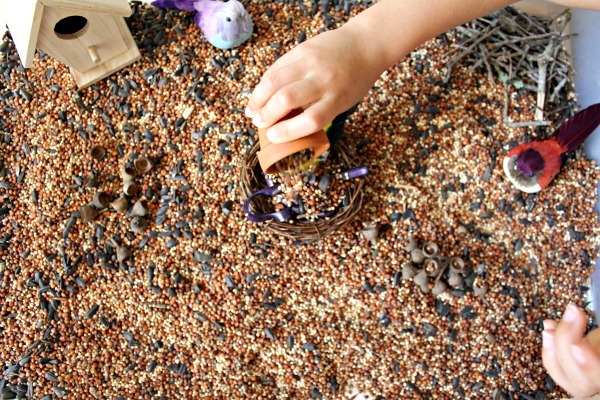 Our sensory bin was filled with bird seed, some pretend birds, a wooden birdhouse, a pre-made nest, and a small terracotta pot for scooping and pouring. We also added our natural materials that we collected outside and the girls began to explore. My preschooler immediately insisted that the birds were hungry, so she had them collect worms and bring them back to their nest. She also thought they might like some bird seed, so she poured a hearty helping for them as well. We continued the discussion of nesting and laying eggs, adding some eggs to the nest for our birds to keep warm. 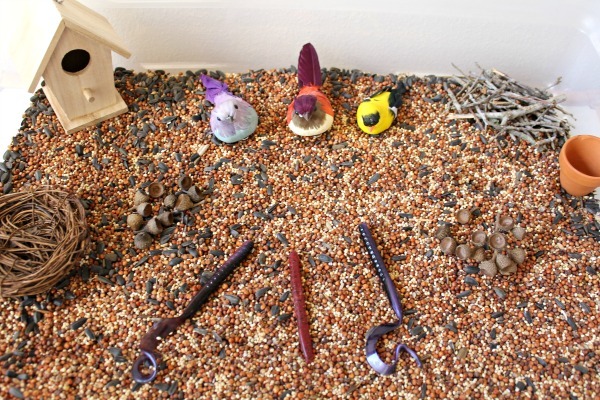 The imaginative fun continued as the girls explored the different types of nests and materials within the sensory bin. I have to tell you- with all the bird seed, it did get quite messy. 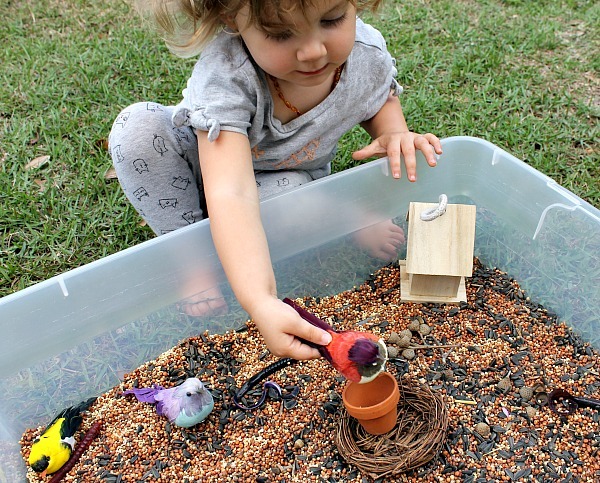 We took our play outside to the grass where we would literally be sharing our mess with the birds. It was an eco-friendly clean up! 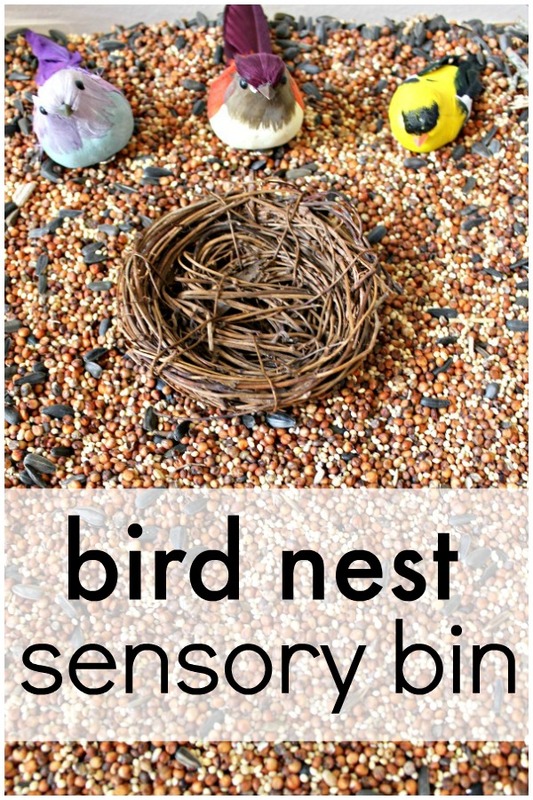 We are looking forward to exploring nesting with our bird nest sensory bin and can’t wait for our newfound nesting friends to welcome their babies! 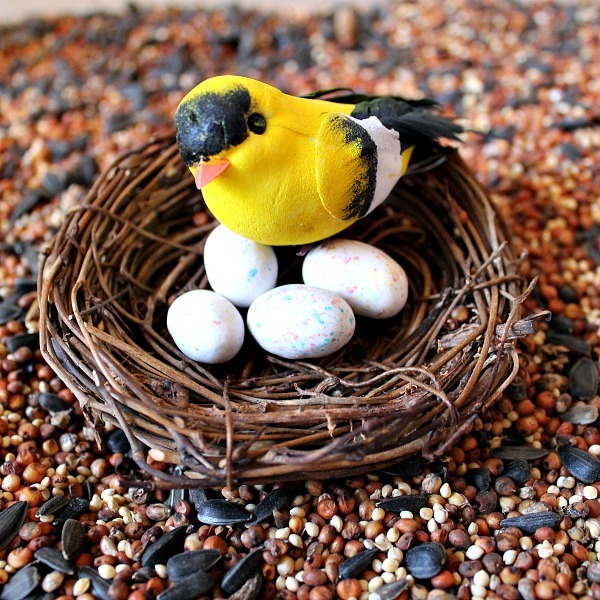 Continue the bird theme fun with bird nest play dough and a bird tally scavenger hunt.